Solomon J Solomon (b. 1860 London, d. 1927 Kent). Portrait and subject painter, he depicted scenes of myth, of history, religion and reality. His portrait of his daughter on a horse not only resides in the Ben Uri collection, but can also be seen hanging on the wall in his later painting 'The Breakfast Room'. 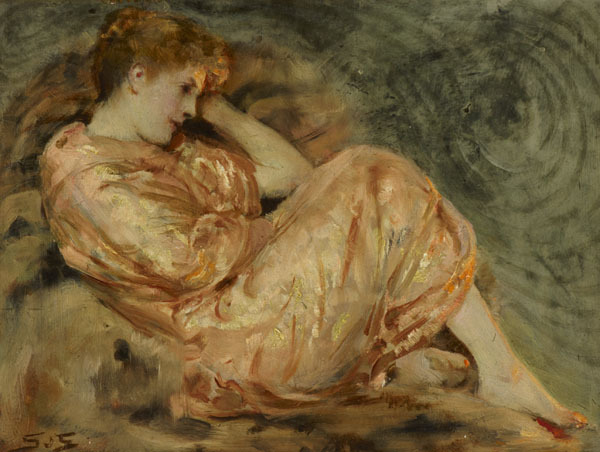 Solomon J Solomon studied variously in London at Heatherley's Art School, 1876 and at the RA schools in Paris and Munich, studying under Cabanel in the former. After traveling in Italy, Spain and North Africa, he settled in London. In 1906 he became the second Jewish Royal Academician, was President of the Royal Society of British Artists, 1918 and the first President of the Maccabeans. His book, The Practice of Oil Painting was published in 1910, serving as a guide for art students and their teachers. Solomon also pioneered the technique of camouflage for tanks and army equipment during the First World War, writing the book 'Strategic Camouflage' (published in 1920) as a Lieutenant-Colonel in the Royal Engineers. His camouflage system was subsequently used in the Second World War. He designed a stained glass window for the Hampstead Synagogue and was President of the Ben Uri Art Society from 1924-26. He died at Birchington, Kent on 27 July 1927.